During the early 1850s hundreds of miners and settlers poured into southwest Oregon and onto Indian lands staking claims and establishing farms. The clash of cultural attitudes toward the ownership and use of natural resources led to the Rogue River Indian Wars of 1853-56. 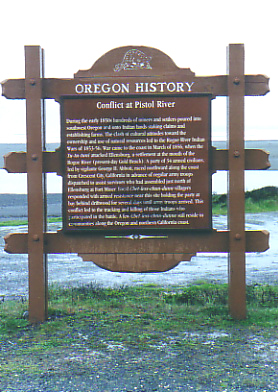 War came to the coast in March of 1856, when the "Tu-tu-tuni" attacked Ellensburg, a settlement at the mouth of the Rogue River (present-day Gold Beach). A party of 34 armed civilians, led by vigilante George H. Abbott, raced northward along the coast from Crescent City, California in advance of regular army troops dispatched to assist survivors who had assembled just north of Ellensburg at Fort Miner. Local "Chet-less-chun-dunn" villagers responded with armed resistance near this site holding the party at bay behind driftwood for several days until army troops arrived. This conflict led to the tracking and killing of those Indians who participated in the battle. A few "Chet-less-chun-dunne" still reside in communities along the Oregon and northern California coast.